Attendant Kits - innovints Webseite! 1 EA Adhesive bandage 6 x 10 cm, 8 ea. 2 EA Gauze compress 7,5 x 7,5 cm, 2 ea. 1 EA Disposable gloves pair, large 2 ea. 1 EA Antiseptic alcohol swabs 10 ea. Contents may be extended according to customer requirements, nevertheless space is limited. 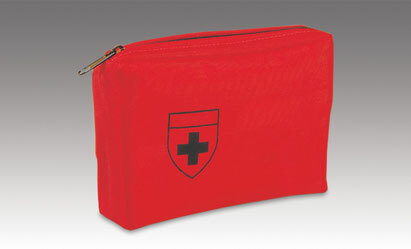 The attendant kit PNR 6240-81 provides for the cabin crew the “all fl ight” necessary first aid sundry items. The certifi ed fi rst aid kit does not need to be used, which avoids the removal of the first aid kit from the aircraft and mandatory part inspection. The soft pocket is made of red Nylon with a zipper. The below listed contents may be extended by some standard medicine, e.g. such as remedy for wounds, nasal decongestant, or loperamide.